5 Best Clearbit Alternatives | Find The Best One? We talk about alternatives of an entity when there is a better option to serve the same purpose. In our case of email enrichment, we can definitely say that there are few competitors that have an edge over Clearbit. More Accurate: Since they dig into multiple web platforms to fetch the details of the leads. Have Wider Information Range: As the software will not rely only on email for enriching leads details. You can provide name, address, and phone number to these search engines. Reliable Data: Because these software will grab the user’s details from the most trusted online sources for you. The high usage of these lead enrichment have been observed and compared with Clearbit by many users across the globe. 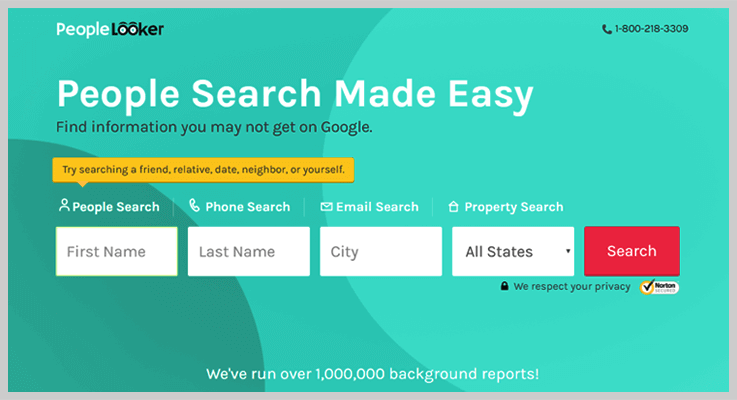 On this basis, we have compiled 5 best Clearbit alternatives. And now to be more precise, we’ve mentioned a table below which consists of various alternatives of Clearbit, their pricings, & features. You will also find that the information of people with the same name does not get mixed up as the tools used “unique algorithm” to distinguish the details. Moreover, you can have criminal records of the users from real law enforcement agencies gives a deeper insight into your leads. That’s a lot much to take in! Now, we’d advise you to read out the services mention below, compare it with Clearbit & finalize the best one according to your needs! With the world’s largest search engine for people, you can get the insight of the leads & fetch the important details single-handedly. This is because corporates giants like Microsoft, eBay, Twitter, BBC, IBM, Deloitte and many more have only used this tool to find, verify & enhance the customer’s profile with records uploaded up to 20 billion. It allows you to collect leads detail with whatever information you have. Be it names, emails, phones, addresses or social account detail. Further, you can have an elaborated demographic information (statistical report based on age, education level, income level, marital status, occupation, religion, birth rate, death rate, the average size of a family) by using this software. Contact Plan: The cost estimation is $0.05 per match along with basic details like name, gender, age, address, and landline. Pipl provides API for your application so you can have the enriched list in your website without relying on the software every time. This means you can get the user information in real time on uploading the leads email list straightaway in your system. The bulk search can be for 100,000 users at once. Further, the details retrieved are used to create a distinguished profile for every user. However, if you are still not ready to get started with the software straight away, this software also provides a live demo option for your convenience. The free-to-use software fetches all the public web content available to you in a short span of time. Its excellent service (regarding people search engine) has ranked the software among one of the top-500 sites in the US. In addition to this, it has got 3 alternatives for you to begin the search. You can provide a person’s name, username or phone number. 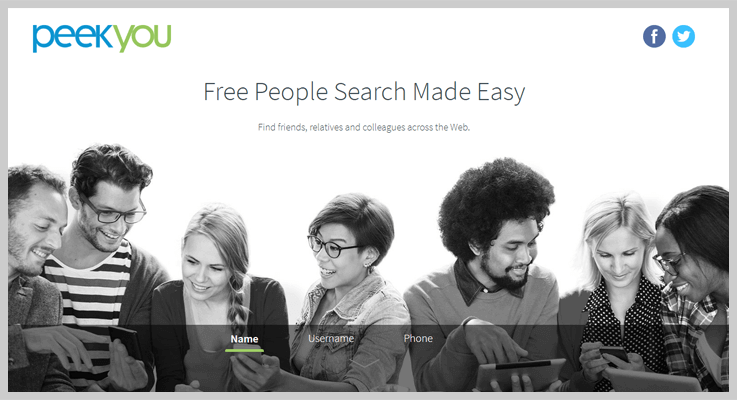 PeekYou provides approx 10 million monthly searches to users so that they can get in touch with their long-lost contacts. To know about the price plans of PeekYou, you have to contact to its sales department. The software analyzes content from 60+ social sites, various news sources, website homepages and blog platforms to spot the associated people with those contents. It further combines the details collected across the various platform like Twitter, Facebook, YouTube, LinkedIn etc. into a comprehensive record. PeekYou uses “unique identifiers” algorithm to match public social profiles, blogs, URLs, etc. so that a unique & accurate result is generated even for people with the same names. 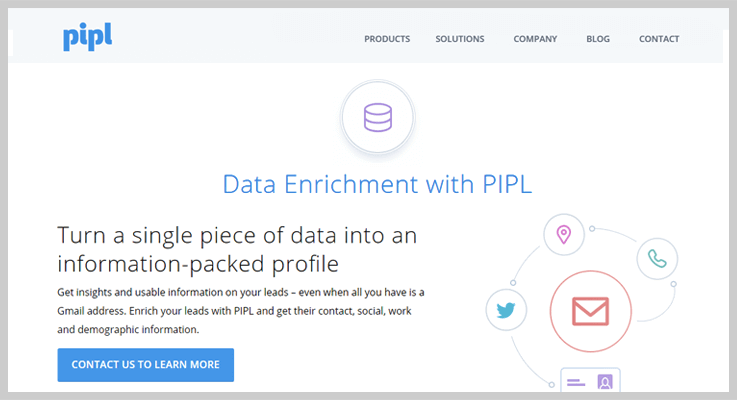 This email enrichment software lets you find the details of the leads of US-based leads through 4 ways: people (via name), phone, email, and property (current/past address) search. You may find multiple entries with the same name & therefore to find the correct person, you can refer to the relative’s details. This helps to resolve the ambiguity that is not possible by altering the name spelling or address at times. Otherwise, you can also narrow down your search by providing middle name, city/state or approximate current age to refine the search. Find the pricing scheme for this software below which is based on the subscription type you choose. 1-month membership at $18.28/month: You will get unlimited email, phone lookups, criminal records etc. 3 months membership at $43.86/month: This pricing scheme will give you faster searching with unlimited background reports, contact information, email, phone & address lookups and a lot more other features. The software notifies you via email on any phone number or address updates. It also informs you about the new social media profile creation or even about any crime committed by the user. All of this will always keep the user details database up-to-date. Also, the overall background reports contain information from multiple trusted sources that include bankruptcy records, career history, social media profiles & blogs from Pinterest, Vimeo, Twitter, LinkedIn, Google+, current address with a map & satellite imagery etc. This tool gives a reverse phone number lookup feature. You can track the unknown person details like his name and location who had contacted you in past. Behind is a powerful email enrichment software which verifies an email and further spots the owner of that email address. You can access the fetched details of almost 2,000,000,000 email profiles in a go. 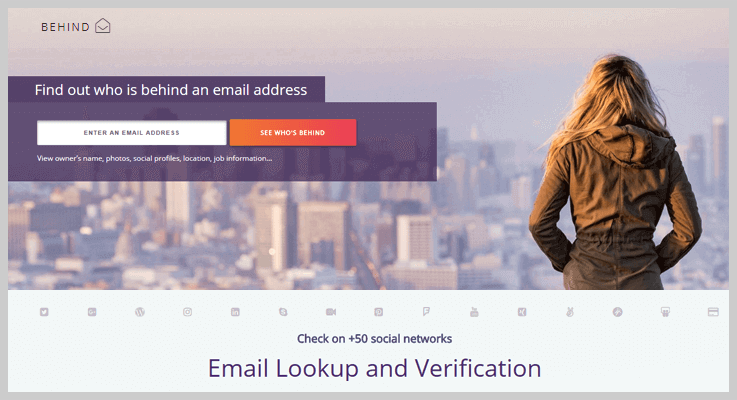 This online email investigator checks on almost 50 social networks to grab the maximum possible information of your leads. If you need to have instant access to the name of email holder location, list of social media accounts, photos etc. you can surely depend on this software. One time report: This plan generates information report for only one email at $1.99. Unlimited membership: With this pricing scheme you can search unlimited emails by spending $4.99/mo. On submitting the email address, this software displays image, name, and the number of social media accounts associated with that particular lead. In addition to this, Behind also finds the alternative email address of the user. In addition to this, you will get his bio, entire career profile, address, and location with map. The software builds a systematic data report on the basis of information that has been collected from various platforms. For eg, there will be section having twitter account details of the user which will include the number of tweets, followers, following, likes etc. Google+ section will have photos and albums, Linkedin will hold complete career background, current job profile, city etc. 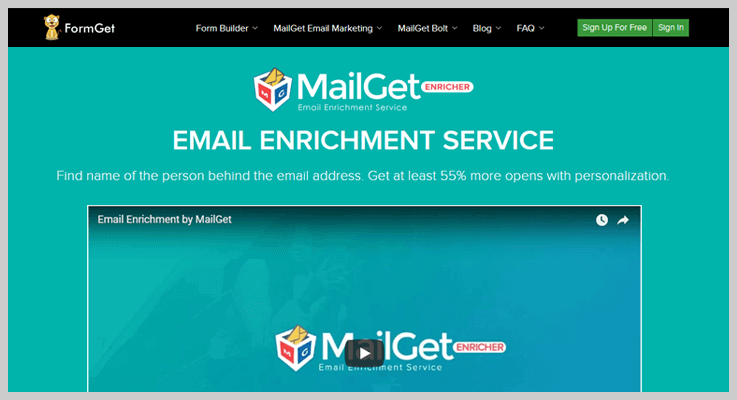 This enrichment tool takes up only an email address of your lead to collect all the possible details in lightning fast speed. And the software offers an all-round profile of the person with 25+ types of details. For instance, it provides, all the personal details like name, age range, gender, photo, and professional details like company’s name, job profile, account in social networks like LinkedIn, Facebook, Twitter, Google+, Flickr, YouTube etc. The software lets you enrich your email list at the lowest price you would ever find. That’s 2 cents/email, which is actually incomparable price provided by any other service. Starter Plan: This plan offers you to have information about 200 leads via emails at $4/month. For example: name, age, gender, occupation, etc. Rookie Plan: You can obtain the data of 1,000 lead information with the low-cost plan of $19/month. The data can be of social media platforms, current location, profile image link, etc. Pro Plan: At $99/month, you can avail the enriched list of 5,000 leads & can look into their bio, followers, following, etc. Advance Plan: The amount you need to lend to retrieve information of 10,000 to 1,000,000 leads ranges from $175 to $9999 respectively. This enrichment tool gathers the data from multiple top most trusted online sources. Hence, the information collected is absolutely accurate & verified. You can upload the emails in bulk (in CSV & Excel spreadsheet) & the tool delivers the enriched list to you in your email. After it, you will be able to download the details & start having a personalized connection to turn those leads into your customers. As easy as ABC. Also, you can check whether the email addresses have the ‘404 error’ or the ‘200 valid’ status. 1200+ companies (and still counting) like Cisco, Harvard & Massachusetts Institute of Technology, Iskcon, Avaya have given their credits to this tool for having great customer insight & better personalization with their clients. I hope this article will help you to great extent for finding out a suitable replacement of Clearbit enrichment tool. The above-discussed services are tried and tested on the personal level for your convenience. They provide you with more accurate lead details in a shorter span of time. Moreover, the data fetched is completely reliable as it is taken out of the topmost trusted web services. Further, you can retrieve a large variety of details about your leads. So, just choose the best alternative of Clearbit according to your needs & create an enriched email list in a much better way! Finally, you can anytime contact us for any query or suggestion!